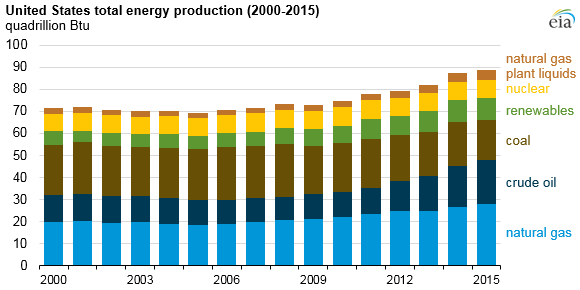 Total U.S. energy production increased for the sixth consecutive year. According to data in EIA's most recent Monthly Energy Review, energy production reached a record 89 quadrillion British thermal units (Btu), equivalent to 91% of total U.S. energy consumption. Liquid fuels production drove the increase, with an 8% increase for crude oil and a 9% increase for natural gas plant liquids. Natural gas production also increased 5%. These gains more than offset a 10% decline in coal production. The United States saw little change in production from nuclear electric power and renewable energy (across all sectors) in 2015. 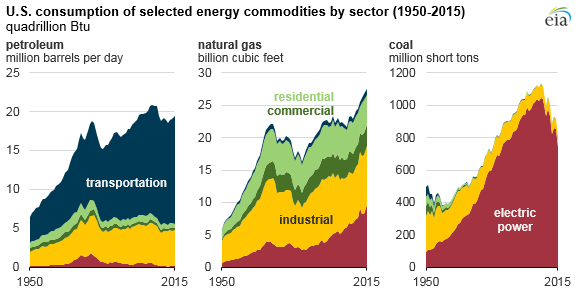 However, the United States saw shifts in the sources of electricity generation from renewable fuels, as declines in hydroelectric generation were mostly offset by increases in electricity genertation from wind and solar. Net imports continued to decline. U.S. primary energy net imports declined for the 10th consecutive year. Imports rose 2%, but that increase was outpaced by a 6% increase in exports. Petroleum products accounted for 71% of U.S. primary energy exports. The fuel mix of energy exports continues to change. In 2008, the U.S. exported more than twice as much coal as natural gas. In 2015, the U.S. exported only 0.1 quadrillion Btu more coal than natural gas. Mexico accounted for almost all of the increase in natural gas exports, while coal exports fell largely as a result of lower demand in Europe and China. Natural gas exports are expected to continue growing as the United States transitions from a net importer to a net exporter of natural gas by mid-2017. Coal led the decrease in consumption. 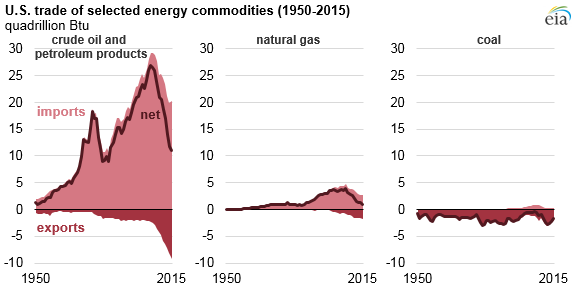 Primary energy consumption declined 1% between 2014 and 2015. Coal consumption fell 13% over the same period. The decrease was mostly offset by a 3% increase in natural gas consumption and a 1% increase in petroleum consumption. Coal's decline in the electric power sector was the major factor in the changing fuel mix of energy consumption. The industrial sector has also seen a shift from coal to natural gas consumption in recent years. Primary energy consumption in the residential and commercial sectors decreased by 9% and 6%, respectively, in 2015. This decrease was likely attributable to a milder winter in 2015, as heating degree days (a measure used to calculate temperature-related energy demand) fell by 10% year-on-year. Meanwhile, transportation sector consumption increased by 2%. The electric power and industrial sectors each saw modest declines in consumption compared with 2014. Carbon dioxide emissions fell. After increasing in 2013 and 2014, U.S. carbon dioxide emissions from energy consumption fell by 2% in 2015. An increase in natural gas used for power generation, largely replacing coal, was the primary reason for this decrease, as natural gas is less carbon-intensive than coal.